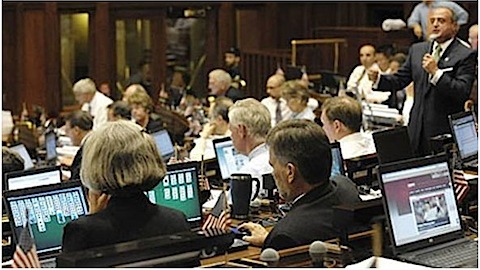 Posted in Commentary at 2:17 am by Jason G.
Here we see House Minority Leader Lawrence F. Cafero Jr., R-Norwalk (standing on far right) speaking while colleagues Rep. Barbara Lambert, D-Milford, and Rep. Jack F. Hennessy, D-Bridgeport, play Solitaire as the House convenes to vote on a new budget. Also, you’ll notice the guy sitting in front of these two to the right is on Facebook and the guy behind Hennessy is checking out the baseball scores. That’s scarry. Looks like we’ll have to take those laptops away. We probably paid for them too. Ugh!